New York Casino Entertainment can help you raise money for a great cause by planning an exciting casino fundraiser in Brooklyn and Manhattan, NY, and the surrounding areas. 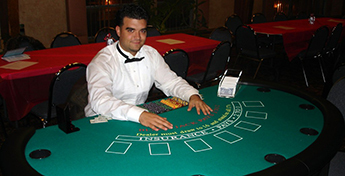 A casino-themed fundraiser is a unique idea that keeps your guests entertained. Collect donations for your charity as guests participate in exciting tournaments in a Vegas-like environment! We create custom packages for any type of charity or non-profit organization. We run popular events such as Texas Hold 'em tournaments and full casino fundraisers with Blackjack, Craps, Roulette, Poker, Money Wheel of Chance, Slot Machines and many other exciting table games. Our goals are to carry out your ideas, raise funds and ensure the success of every detail. 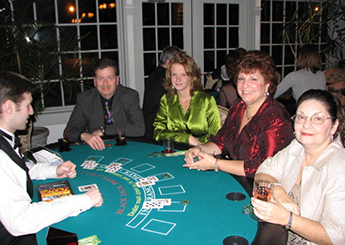 We'll set financial goals and plan everything that you need for an authentic night-gaming event. From creating a professional and classy gaming environment to adding additional entertainment to take your event to the next level, our services are hassle-free. We can provide a 'Cashier Booth' for your guests to purchase additional play money and to '"cash out" into raffle tickets. Although we are experts in replicating a realistic Vegas experience, guests will not play for real money because of legal regulations. We can help you arrange exciting prizes, auction items for bid or raffle tickets for winners. Call New York Casino Entertainment in New York to learn more about how we can create the most successful casino-night fundraising event. We host special events in the surrounding areas of Brooklyn, Manhattan, the Bronx, Staten Island, Long Island, Westchester, Rochester, New Jersey and Connecticut.